Practice makes perfect, right?! The writers of the ATI TEAS Exam are sharing 10 practice questions to help kick off your studying. PS – Scroll to the bottom for rationales and answers. Want to prep more for the ATI TEAS Exam? Check out these resources! Question 1: Which of the following words is spelled correctly? Question 2: Did you know that Bill will pick us up tomorrow? Which of the following phrases could replace the word “us” in the sentence above? Question 3: A photograph measure 15 cm wide and 20 cm high. If the photograph is enlarged to a height of 28 cm, which of the following measurements would be the new width? Question 4: Which of the following is the scale of the y-axis in the bar graph? We are writing today to invite you to Frank’s Furniture Emporium for our biggest anniversary sale yet! For 35 years, Frank has provided the community with quality furniture. As a token of appreciation for decades of business, Frank is cutting prices like never before! On August 1, save 35% on everything in the store! From luxury couches and recliners to weatherproof outdoor tables and chairs, this is a sale you can’t afford to miss! Don’t forget to bring the kids: we’ll be grilling hot dogs and hamburgers from 11 a.m. to 1 p.m.
Start August the right way by saving big on your next furniture purchase! The next two items are based on this passage. Question 5: Which of the following information can be found in the closing of the letter? Question 6: Which of the following identifies the mode of the passage? Question 7: The receptionist was told to post the job announcement. Which of the following is the best definition for “post” as used in the sentence? Question 8: Vitamin D is required for the intestinal absorption of which of the following substances? Question 9: Which of the following hormones increases the most after ovulation occurs? Question 10: A student needs to accurately measure 17 mL of a solution to use in an experiment. Which of the following pieces of equipment should the student use? This is the correct spelling of this word. The correct spelling of this word is “liaison”. The correct spelling of this word is “memento”. The correct spelling of this word is “sergeant”. The word “us” is an objective pronoun and can be replaced only with other objective pronouns. The word “me” is an objective pronoun, but “she” is a subjective pronoun. Both “her” and “me” are objective pronouns, which is the same part of speech as “us” as used in the sentence. The word “us” is an objective pronoun and can be replaced only with other objective pronouns. The word “her” is an objective pronoun, but “I” is a subjective pronoun. The word “us” is an objective pronoun and can be replaced only with other objective pronouns. The words “she” and I are both subjective pronouns. This response is the result of incorrectly applying additive reasoning and concluding that, because the height of the photograph increased by 8 cm, the width also increased by 8 cm. However, multiplicative reasoning should be used to reach the correct answer. This response is the result of incorrectly applying additive reasoning and concluding that, because the original width of the photograph was 5 cm smaller than the original height, the enlarged width should also be 5 cm smaller than the enlarged height. However, multiplicative reasoning should be used to reach the correct answer. This response is the result of incorrectly relating quantities in the problem. If the enlarged width was 28 cm, then the enlarged height would be about 37 cm. This response is the result of correctly relating the quantities in the problem by setting up and solving the proportion 15/20=x/28 or an equivalent proportion. This response is the result of incorrectly interpreting that one mark on the y-axis represents one student. This response is the result of correctly interpreting that one mark on the y-axis represents five students. This response is the result of describing the x-axis rather than the y-axis. 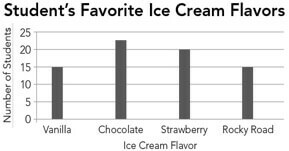 This response is the result of incorrectly providing the greatest y-value displayed on the y-axis rather than the scale of the y-axis in the bar graph. The date of the event appears in the body of the letter and is not stated in the closing. The name of the furniture store appears in the body and the signature of the letter and is not stated in the closing. The closing line appears between the body and the signature of the letter and includes this information only. The time at which grilling ends appears in the body of the letter and is not stated in the closing. The passage does not include information about an individual person and does not describe a sequence of events. The passage is an invitation to a future event and does not react to a past event. While there are some descriptive words in the passage, its main focus is factual information about an upcoming event. The passage uses persuasive words like “invite,” “save,” and “start,” establishes the furniture store as a community fixture, and offers opportunities for discounted prices and food to encourage the reader to attend the savings event. This definition does not fit the context of the sentence. This definition is correct because it fits the context of the sentence. It is the most accurate description of the action a receptionist would take with a job announcement. The synthesis of the carrier protein that is involved in the active transport of calcium in the small intestine is dependent on vitamin D. Calcium can also be absorbed through a passive process that does not involve or require vitamin D when a person’s diet is high in calcium. Potassium diffuses through the small intestine, in the ileum and jejunum sections, on its own. This is a passive process that does not require the help of vitamin D.
Iron is absorbed directly by mucosal cells in the duodenum section of the small intestine without the help of vitamin D.
Sodium is absorbed in the small intestine through active transport. It is often co-transported with glucose and amino acids, but vitamin D does not play a role in the active transport of sodium in the small intestine. Progesterone is secreted by the corpus luteum that forms after ovulation. It promotes the thickening of the endometrium. Estradiol, which is a form of estrogen, is also secreted by the corpus luteum that forms after ovulation. It promotes the thickening of the endometrium, but more progesterone is released than estradiol. Follicle-stimulating hormone (FSH) decreases after ovulation. It stimulates the growth of the follicle and increases prior to the follicle rupturing, which then releases the secondary oocyte through ovulation. Luteinizing hormone (LH) decreases after ovulation. It stimulates the growth of the follicle and increases prior to the follicle rupturing, which then releases the secondary oocyte through ovulation. Beakers are generally used for stirring, mixing, and heating liquids, not for measuring the volume of a liquid. Although there are graduated beakers, the markings are only approximate, and, thus, they are not as precise as graduated cylinders, especially for smaller volumes such as 17 mL. The main function of a graduated cylinder is to measure the volume of a liquid. The main function of a dropper pipette is to transfer liquid from one container to another. The main function of an electronic balance is to measure the mass of an object.